This route starts at Ssanggyesa (temple), winds up past Buril Falls 폭포, and ascends to the Samshin Peaks. From there it's either down to Cheonghakdong or back the way you came. It's a steep trail in places and a dry one (there aren't any springs in this vicinity beyond the temple), but one of the positives is that it seems to be less frequented than some of the other trails. From the temple, the trail leads 2.3 km up to Buril Falls, which can be impressive after heavy rains and underwhelming at other times. Beyond the falls, the hike has nice coverage, snaking through shaded forest areas and along a small stream. About two thirds of the way up, the tree cover opens up and nice views of the valley can be seen. It's possible to reach Samshinbong, the furthest but not the highest of the two peaks, in 3 1/2 to 4 hours (6.9 km from the Buril Falls junction). The hike down to Cheonghakdong takes about 1 to 1.5 hours, while a return hike back to Ssanggyesa can be completed in 2.5 hours. This monster hike begins at Yupyeong Village (just beyond Daewonsa), ascends to Chibanmok Shelter, crosses the ridge--including Sseoribong (1,642 m), Jungbong (1,875 m), Cheonwangbong (1,915 m), Jeseokbong (1,806 m), Chotaebong (1,704 m), and Yeongshinbong (1,652 m)--and descends from Seseok to the Georim Valley exit. The hike from Yupyeong Village to Chibanmok Shelter is steep and rocky for the first 2 km or so. Then it levels off for awhile, passing through amazingly lush forest and above a deep river valley. There are gentle ups and downs and some nice views when the clouds lift. The trail is rough, but well-marked most of the time (look for pink ribbons in the trees or periodic cell service markers if you aren't sure). During or after heavy rain, temporary streams form that cross the path or completely replace it (I was here once during a typhoon). The rivers can become swollen and dangerous, in which case it's best to avoid them. The last 2 km again regain a steep incline and include a series of metal steps. The park service estimates hike time to Chibanmok at 3.5 hours, but I was able to do this stretch in 2 hours and 10 minutes at a brisk pace. This ascent is less difficult than the Hwaeomsa trail on the other end of the range. From Chibanmok to Jungbong, the path goes up and down quite a lot, but there’s nothing terribly steep. There are tiny granite markers at Sseoribong and Jungbong, but not much else to let you know you reached a point of signficance. Cheonwangbong--the highest peak in Jirisan and 2nd highest in Korea--is only another 0.9 km beyond Jungbong (3rd highest). The 4 km from Chibanmok to Cheonwangbong can be accomplished in under 2 hours in good weather. Note that much of the ridge is exposed to brutal northerlies. Even in late September, it was nippy. Two months later, the trails were icy and dangerous, there was a dusting of snow on the ground and trees, and strong freezing winds blasted us from the north whenever we came out into an open place. Appropriate windproof clothing is suggested. A complete white-out is not uncommon on the ridge. Out of three recent trips, there was clear weather on only one, where we got great views from the top of Cheonwangbong. I'm told you're very, very lucky if you get any good views from the top at any time of year. 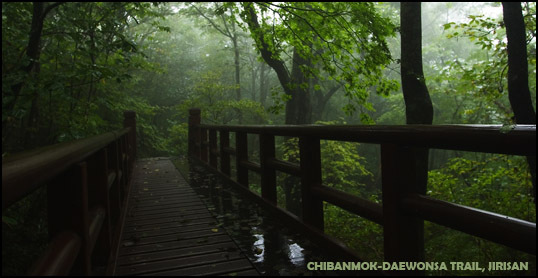 At Cheonwangbong, a 9.7 km trail leads off north through Chilseon Valley to Chuseong Village, but a large portion of this trail is currently off-limits for nature restoration. From Cheonwangbong, it took only 30 minutes to cross the relatively easy 3.4 km to Jangteomok Shelter (about 1 hour going the other way). There’s quite a lot of downhill along this section going west. Jangteomok is a large, ample shelter that requires reservations, except in cases of emergency. From the shelter, trails go north to Baengmudong Village and south to the Rotari Shelter and Jungsan-ni Village. From Jangteomok going west, it's more of the same with some ups and downs and fairly good trails for a distance of 3.4 km. It took me about 1 hour and 10 minutes to reach the third and largest of Jirisan’s shelters, Seseok. Seseok Shelter is at the junction of several trails. Going west, follows the ridge route 6.3 km to Byeoksoryeong Shelter and eventually to the end of the range at Hwa-eomsa (Temple). Going north takes you 6.5 km to Baengmudong Village. Going south, you can exit the park through Daeseong-ni (9.1 km), Cheonghakdong, or Ssanggyesa (19 km). The latter two trails are very long, following the southern arm of the mountain away from the ridge. Another trail leads southeast 6 km to Georim Village. The Georim trail is extremely steep, rocky, and brutal. There are large sections of jumbled rocks and boulders that hikers must pick their way through. Coming down was hell after already doing 21 km, and I can imagine heading up this trail is pure torture. The park service estimates this hike at 11.5 hours. I did it in late summer in 9 hours, but without any breaks longer than 10-15 minutes. I packed light and moved quickly--a slower pace would be safer, especially on the downhill sections. The same section of the ridge was hiked in much colder weather going the other direction and it took a couple of hours longer. This route starts at Hwa-eomsa (temple) and ascends steeply to the main ridge near Nogodon Shelter. From there, the trail follows the mountains east. Hwaeomsa Service Complex is a good 30-minute walk (about 1.5 to 2 km) from the temple up the road. The trailhead is to the right when facing the temple entrance. It starts out with a short walk through a grove of trees and then quickly begins to climb. From that point on expect a steep 7 km slog to the top. This particular approach seemed brutally steep and endless in contrast to the climb from the east, starting at Daewonsa. But maybe I was just carrying more weight. It took us about 2.5 hours to get to the Nogodon Shelter area. Don't be disconcerted by the crowds around Nogodon--many people just do the easy walk from Seongsamjae and then turn around. Everything thins out as you move east. The 3.2 km from Nogodan to Imgeolryeong (ridge) was characterized by ups and downs, but nothing terribly difficult. At Imgeolryeong, a trail leads south 6 km past Piagol Shelter and out of the park at Jikjeon. Another 1.3 km beyond that, we came to the turn-off for Banyabong. According to the KNPS website, Banyabong is closed to hikers. But not seeing any signs on the trail, we decided to try. We opted to dump our packs for the short 2 km hike to the peak (about 45 minutes round-trip), which turned out to be a great idea. Banyabong is famous for its views, especially around sunset, but we encountered heavy fog and could see nothing below. The peak is marked with a small, inconspicuous granite pillar. There were no signs to indicate that the area was restricted and we saw quite a few other hikers there. After Banyabong, we moved on to Baemsagol Shelter, which we were surprised to find was closed. People were still using the area for cooking and the drinking water was flowing, but nobody seemed to know why the shelter was closed and if it would be open again in the future. It's located at the bottom of a long series of stairs. From Baemsagol, a trail leads north 9 km to Banseon Service Complex in Namwon County. Not far beyond this, another trail leads south through the Moktong Valley to Chilbuam and eventually the Hadong park exit. We hurried on past the rather insignificant Tokkibong and Myeongseonbong, stopped briefly to stock up on water at Yeonhacheon Shelter, and finally made it to Byeonksoryeong Shelter by late afternoon (about 7.2 km from Tokkibong). The last little bit before the shelter is quite rough and rocky. Take two monster day hikes and put them together and you have...well, pain. But also a lot of fun! We just completed this hike in mid-November over a period of two days (10 hours from Hwa-eomsa to Byeoksoryeong Shelter and 9 hours from Byeoksoryeong to Daewonsa). It's more typical for people to cross the ridge in three or four days, but a weekend sprint is definately possible from May through November. The rest of the year it's too cold and icy to risk moving that quickly. We started with a 30-minute walk up the road from Hwa-eomsa to the service complex early in the morning. The trailhead is to the right of the temple entrance. The 7 km to the ridge was the steepest and most challenging part of the whole experience for us, maybe because we weren't warmed up. We got to Nogodon in 2.5 hours, but it was painful. The next 4.5 km to the Banyabong turn-off was relatively easy, with alternating ups and downs. At this point we stashed our packs in the forest and did a quick sidetrip to Banyabong, which took 45 minutes round-trip. After returning to the main ridge trail, we moved on past Baemsagol Shelter (down stairs north of the trail), Tokkibong, and Myeongseonbong. We took a short water break at Yeonhacheon Shelter and moved on to Byeonksoryeong Shelter in the late afternoon. The last hour was a bit rough. We were feeling pretty worn out and the trail seemed unusually rocky and uneven. In all, the hike from Hwa-eomsa to Byeonksoryeong took us 10 hours. We stopped there for the night. We didn't have reservations, but they grudgingly put us up anyway. The night was very long and very hot with lots of people snoring loudly all around us. There are no pads or mats on the sleeping platforms, which makes for a sleepless night if you not have your own padding. In the morning we got up early and were on the trail by 4:30 AM. It took us about 90 minutes to do the 6 km to Seseok, where we took a bathroom break, before sprinting on to Jangteomok. Strong, cold winds were blowing a light snow on the northern side of the ridge. When the trail snaked over to that side we had to bundle up, but the south side was quite comfortable and without wind. The section from Seseok to Jangteomok seemed to be gradually uphill the whole way, so this part took us as long as the former portion even though the distance was much shorter. We reached Jangteomok about 7:45, took a breather, and struggled toward Cheonwang Peak. We got to the summit about 8:30 and spent about a half hour there. Again, the north side of the summit was cold and blustery with a thin layer of ice and snow, while the south side was mild and dry. Once beyond Cheonwangbong, the trail was more or less downhill, which was less of a cardio workout but really hammered at the knees and ankles. We only took a couple of 5 minute breaks between there and Daewonsa, reaching the end around 1:30 PM--a total of 9 hours. The last section from Chibanmok to Daewonsa was pretty brutal downhill stuff, especially on tired legs. We both would have preferred a little more climbing to the high impact slamming you get from moving downward. This hike begins at Jungsan-ni Tourist Village, passes Kalbawi, and continues steeply for 4 km to Jangteomok Shelter. From there it's another 1.7 km eastward along the ridge to Cheonwang Peak. We set out on the trail around 1 PM, which we discovered was much too late to be starting a hike like this. We were in reasonable shape but not athletic really. It took those of us in our 20s and 30s about 5.5 hours to reach the summit, while those in their 40s took about 6.5 hours. The sun went down about thirty minutes before we got to the top (a good reason to start earlier). Hiking in the dark was not especially fun. The one person in our group who had done the hike before made it up to the top in 3 hours. The trail is quite steep--it's like climbing stairs for the whole way. I'd recommend leaving in the morning to better enjoy this hike, rather than trying to race the sun. Note that we did this hike in April, and there was still some snow and ice near the summit. The air was very cold. Some warm clothes are advised. I recently hiked from Daeseong-ni to Cheonwangbong and back the way I came. The hike was beautiful and we were on the trail for 6 hours without seeing another person. However, unlike the main ridge, the Daeseong-ni trail has no place to refill your waterbottles. There is a little village about an hour from the start of the hike. Be aware that this the last place to get water before you get to Seseok Shelter. Make sure you pack enough H20. There are plenty of potable springs 분수대 along the ridge for refilling water bottles, so it's not necessary to carry large amounts of water. You should plan to drink 4-5 liters during a full-day hike (more in hot weather). The shelters 대피소 don't sell enough food to make a full meal. They have things like ramen, canned meat, pre-cooked rice, canned coffee, cookies, and crackers. There's also no way to cook anything unless you bring your own stove. Packing in plenty of food is important (3,000-4,000 calories a day during the warmer seasons / 4,000-5,000 calories for winter). About 75% of your calories should come from carbohydrates. Camping on the mountain is illegal, but possible in extreme emergency situations. I've encountered Koreans tenting it in various places on the ridge. In such a case, you'd need a tarp or tent to keep you dry and a good sleeping bag to stay warm. Baemsagol Shelter was closed to overnight hikers, as of November 2007, though you could still cook outside the shelter structure and get water at the spring. The use of gas backpacking stoves is limited to the shelter grounds and illegal in all other areas. Pack out ALL your trash, rather than make it a burden for the shelter caretakers.